MY FAMILY: ADVANTAGES AND DISADVANTAGES OF WATCHING TV. 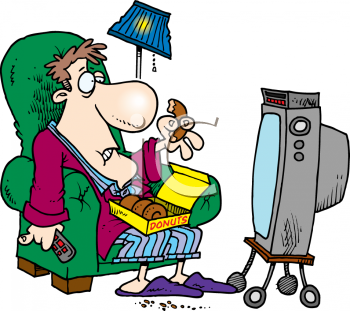 Hi!, how are you?, I´m fine, ok.. Today I´m going to talk about some advantages and disadvantages of watch TV. I think is a very interesting topic for us, since television to play an important part in our life despite influence of the internet and other technologys of information. I think one of the most important disadvantages is wasting time, since some people to spend long hours watching tv programmes what are not useful for them, I like to watch tv, but I don´t spend much time in front of this, I spend one or two hours daily when I have time and when I feel bored and I want to see interesting things what happen around the world, but on the other hand I think people who spend long hours in front of the television could do another kind of activities in that time, for example they could practice any sport as for example to play volleyball or to play football, or they also could read books or going to the theatre, among other things, in the same way I think to watch tv is harmful to our eyesight, since our eyes get tired and after we have to wear glasses, I think also people become tv addicts, in the same way I think another disadvantage is when children to see violence acts on the television because it affect their phase of growing, they also try to imitate to the characters. On the other hand one of the most important advantages of watching tv is that we improve our knowledge, since for example when we watch news or when we watch scientific channels, we have the opportunity of to be well informed about what´s happening around the world, in my personal opinion when we watch news we learn new vocabulary, in this way we improve our cultural heritage. Another advantage is that we get entertainment, many competitions can be watched, I remember when I watched the Olympic Games, I felt really very excited and I could get a lot of fun. I also think with the help of tv it´s possible to learn foreign languages, another advantage is that we can select programmes what we want to see, but I think one important advantage is that we can provide our creativity, because for example when I watch tv I can imagine a lot of things and it help me when I do my homework, ok that´s all see you the next week.